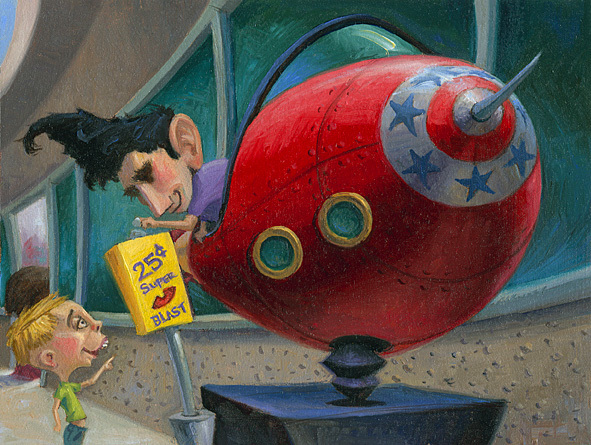 After settling in and pulling a pair of aviator goggles from the dark recesses of his backpack, Meldwyn starts plugging quarters into the slot in the rocket’s coin box. As the rocket starts to rock and tilt, Meldwyn continues to plug quarters in. The rocket begins to rumble and little Timmy turns his attention from the spiders crawling on the sidewalk to Meldwyn and the energized rocket. Fueled on sugar and curiosity, he starts dancing from foot to foot and jabbering at Meldwyn over the increasing din. M...”You ever seen Peter Pan? M...”Yep, $27.50 in cold hard pixie dust. I figure about 110 times the normal price should do it, just like NASA and the Air Force. If they can make the B2 fly, I figure I got a shot. Stand back kid, it’s rock and roll time.” Meldwyn had always wanted to say that out loud. The rocket’s rumble turns into a roar and the intense vibration sends a not unpleasant sensation deep into Meldwyn’s lower shakras. Meldwyn smiles like the happiest idiot on planet earth and tries not to tinkle in his favorite green polyester pants as he begins the countdown.